The H Street Corridor, located in the northeast quadrant, is one of the fastest growing neighborhoods in the District of Columbia. H Street is known for its artistic culture, variety of eateries and its vibrant nightlife, complete with dance clubs, rock venues and various live shows. H Street is sometimes referred to as The Atlas District based on the recent reconstruction of the historic movie theater. Much of the area’s growth came from revitalization efforts in the early 2000s and the neighborhood has been targeted for the completion of a new streetcar track that will run the length of H Street. 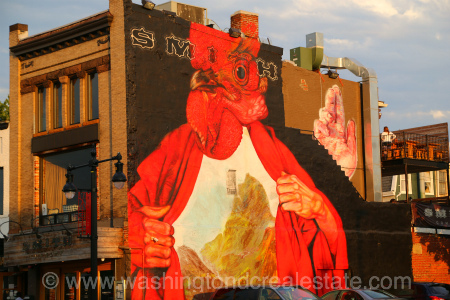 Read more about H Street Corridor real estate. H Street Corridor housing stock includes a mix of row houses, many of which are being remodeled or upgraded as local developers continue to pour money into the area to revitalize housing, vacant store fronts and larger commercial tracts. The area itself is divided into four zones, including an arts and entertainment district and mall at the eastern end, and office and residential area on the western end. The H Street Corridor is bounded by K Street to the north, 17th Street to the east, F Street to the south and North Capitol Street to the east.